All events in place Murter ! Surface : 40 m2 (1. floor). Surface : 130 m2 (Ground floor). No. bedrooms: 3, No. of bathrooms: 1. Characteristics: With a view to the sea, in silence, with terrace, with garden. Price options: Tourist tax is included. Prices are the total price for building / apartment on the day. Included are: utility fees in regular ratio of consumption (electricity, water, gas), weekly change of sheets and cleaning. Pets: € 5.00 / day Pet price is charged separately. Murter is the largest and oldest settlement on the island of Murter. They call it the 'metropolis' Kornati, because its residents own almost all of the Kornati islands and the adjacent islands.In their possession was every seventh Croatian island, hence the life and development of Murter Murter impossible to imagine and understand without the centuries-old relationship with the sea and islands. Extremely valuable archaeological finds Colentum Roman settlement on the hill Gradina vividly testify to the attractiveness of the position of Murter since ancient times. The old part of town - The village is located beneath Mount Raduč, retiring to the interior of the island.Due to the increasing orientation of the population of the sea, the newer part was built on the banks of the spacious bay Hramina. Place over time expanded to Slanica on the southwest coast, where the namesake beach, beautiful on the Sibenik Riviera. Although long believed that his name has to do with death, Murter is the name most likely comes from a hollowed stone bed which is situated within the oil presses, and it was called - mortarium.This origin of the name refers to the long tradition of olive growing in this region. Murtersko oil is widely known. Sometimes there are cultivated over 170 000 olive trees and produced annually about sixty wagons of the famous oil. As early as 1913th Mr Murtersko oil received a gold medal for quality at the prestigious international exhibition of oil in the French Eixu. 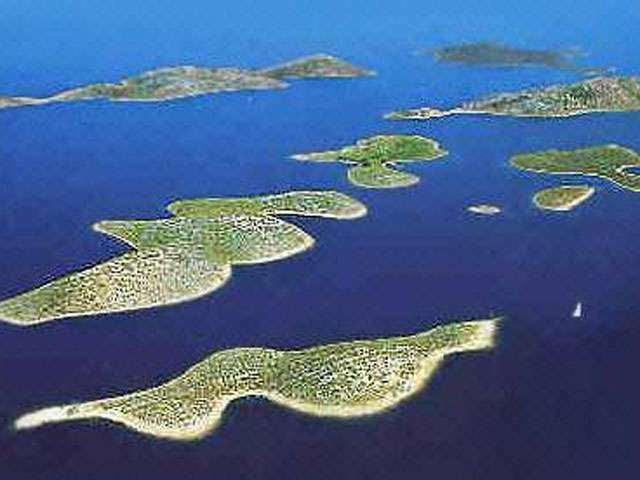 Since the Kornati largely held Murter, Murter ranging from the highest quality tours to these islands pearls. At the tip of the ruins are located is the Church of Our Lady of the fort from the 17 th century. It is a baroque building with subsequent semicircular apse of the 17th century Arriving at the site of the Church of Our Lady of Citadels, pause for a minute, there is a cemetery where sleep centuries old and people from Betina Murter. Here are found and Croatian graves. This church was built on the foundations of an early Christian church.Researchers approach the little darling this beautiful building, on the right you will find a bricked wall of stone carved with a cross characteristic of 6th To the left you will see the cross lintel which testifies that the church has lived on through the Middle Ages. At the foot of the hill Citadels lie the remains of a Roman town Colentum. It is assumed that the 2 ga century pirates attacked and destroyed. On the hill there is a Vršina Church. Deadline of 18 century and it can be reached by a narrow road or stairs from the main road. The church was built by the patron saint of plague in the sign of the covenant and gratitude. If you find yourself in 16.kolovoza Murter, you can join the pilgrims carry the statue through the old part sv.Roka Murter There is a fantastic view of the entire Murter and Betina. The experience itself is worth a look to climb to the top. The prettiest and most popular is the church. Michael arrived at by a beautiful garden. The church is rkonstruirana in 18 th century and is famous for its beautiful Baroque altar that is certainly worth a look. Murter is the entrance to the National Park Kornati.Kurnatari, as they are called residents of Murter, own almost all the 150 islands in the National Park. For centuries on their property building dry stone walls and worked hard to cultivate land. This natural phenomenon is rich in flora and fauna, beautiful scenery, 1980 was declared a national park. The main town beach is Luke. It is a pebble beach with large plateaus for sunbathing. The beach has a mild and respond to children and weak swimmers. The most popular beach in the bay Brine. The beach is surrounded by rocks and pine trees and provides plenty of shade.